A few days ago we bumped into a very nice surprise on Instagram. 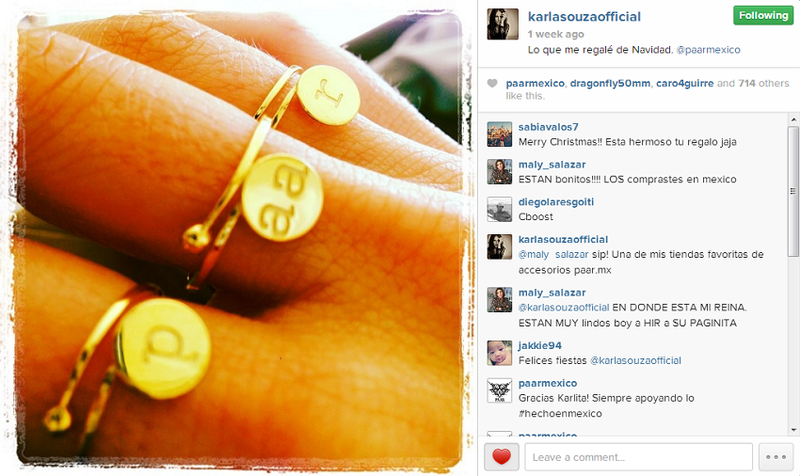 The Mexican actress Karla Souza uploaded a photo to her Instagram account where she is wearing our Triple Ring. We cannot be more grateful for this amazing post, and we are happy to see that Mexican artists support Mexican brands. Keep up the good work Karla, and thanks so much for being a happy PAAR customer! Follow Karla on Instagram! Hace poco nos encontramos una muy grata sorpresa en Instagram: la actriz mexicana Karla Souza subió una foto suya usando nuestro anillo triple a su cuenta de Instagram. Nos da mucho gusto que actrices mexicanas como ella apoyen a marcas mexicanas como la nuestra. Ojala todos los artistas fueran así! Muchas gracias Karla por apoyar lo hecho en México. Ya sigues a Karla en Instagram? Nice Buckets ring. you looking so beautiful. I visit this blog first time and encourage by this well-done work. Extraordinary post keeps up posting such unbelievable information. That is the specific decent post you have imparted to us. I extremely loved it. It would be ideal if you continue sharing increasingly data.Appreciative to you for the post. I truly worshiped the way you framed this post. my best essay writer also providing different type of essay related service It has some good data, which is framed plainly.Continue sharing such awesome and gainful post.